There is more than one black forest cake recipe around, however, an authentic Schwarzwälder Kirschtorte must meet certain standards. 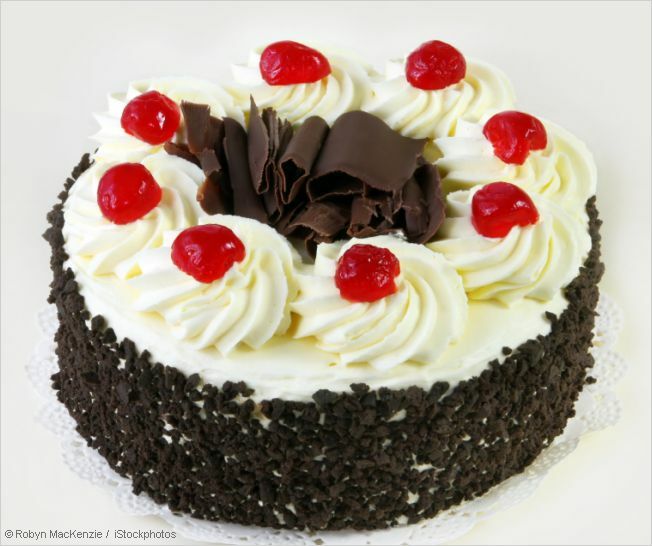 Read on, and learn what makes a great black forest cherry cake. 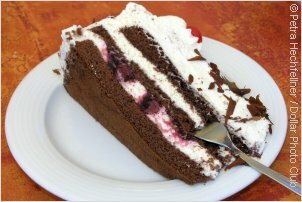 It is not certain that the Schwarzwälder Kirschtorte originates in the black forest at all, probably the cake came from Switzerland. Also, the creator of this most famous German cake is not proven. The cake was first mentioned in a German pastry recipe book in 1934. I know we Germans sometimes overdo with regulations, and of course there are rules about our delicious Schwarzwälder Kischtorte as well. Take it as a sign of quality, that you get the real thing. According to the German guidelines for fine pastries a black forest cherry cake must include the following ingredients. the gateau is covered with whipped cream or butter cream and decorated with cream roses, cherries and grated chocolate. The Schwarzwälder Kirschtorte got its name neither from the mountain ranges, nor from the cherries the cake contains. Actually, the "black forest Kirsch" gave the name. Kirsch is the common name for Kirschwasser, the clear schnapps which is not a sweet liquor. "Schwarzwälder Kirschwasser" is a tradename. Cherries from the black forest area must be used, and the Kirsch must be distilled in the black forest. So the black forest cherry cake is definitely not a dessert for children and people who should avoid alcohol. Now let's get the baking tin and food processor out of the cupboard and start making this delicious cake. Making a Schwarzwälder Kirschtorte is not done in a few minutes, however, the result is most rewarding. If you are in a hurry, you can use ready-made sponge cake layers from a good pastry shop. This black forest cake recipe uses a shortcrust pastry bottom because a sponge bottom often gets too moist to serve the cake properly. Before you start, please check this page for flour facts and gram to cup conversion. Preheat the oven and grease a 28 cm (11 in) springform pan. Sift flour, baking powder and cocoa into a mixing bowl, add butter, sugar, vanilla sugar and Kirsch. Knead the dough either with your hands or with a hand mixer (kneading hook) for 5 minutes until you get a smooth dough. Roll the dough out and line the bottom of the springform pan, prick the dough a few times with a fork. Bake in the preheated oven at 180°C/350°F for 15 minutes. Remove the pastry immediately from the pan and let it cool on a wire rack. Clean the springform pan, grease the bottom and line with baking paper. Put the eggs into a large mixing bowl, use a handmixer at the highest speed and whisk the eggs until foamy. Slowly sprinkle the sugar and vanilla sugar into the egg mixture while you continue whisking. Whisk for at least 2 minutes after the sugar is added. The egg mixture should be very fluffy and nearly white. Sift and mix the flour and cornstarch, baking powder, cinnamon and cocoa, and stir into the egg mixture quickly. Spoon the sponge dough into the prepared springform pan, flat the surface, and bake it for about 30 minutes at 180°C/350°F. Remove the sponge from the oven, remove the ring from the pan and let the sponge cool down. Carefully peel off the baking paper and cut the sponge in half horizontally. Blend the arrow root/cornstarch with a little of the cherry liquid in a sauce pan, stir in the rest of the juice, and the 4 teaspoons sugar. Heat the liquid until it boils, stir occasionally, and let it simmer for a minute, add the well-drained cherries (set 14 cherries aside for the decoration) and remove from the oven. When the mixture is cool add the Kirschwasser. Soak the gelatine in the cold water for ten minutes, warm it up while stirring until the gelatine has dissolved. Let it cool. Whip the cream until nearly stiff, add the gelatine, the sifted icing sugar and the vanilla sugar. Continue whipping until the cream is very stiff. Put the shortcrust pastry on a serving plate. Spread the cherries on the bottom layer, leaving 1 cm (1/8 in) uncovered around the edge. Add one-third of the cream and flatten with a cake spatula. Put a sponge layer on top and press lightly. Spread half of the remaining cream and add the second sponge layer. Fill a pastry bag (star-shaped nozzle) with 3 tablespoons of cream. Cover the entire cake, top and sides, with the remaining cream. Decorate your masterpiece with 14 cream roses, put a cherry on each rose, and sprinkle chocolate curls on the side and top of the cake. Refrigerate the black forest cherry cake for at least 3 hours. If you really want to taste the Kirsch, you can sprinkle an extra tablespoon Kirsch on the sponge layers. 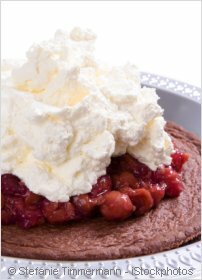 While the cake is in the fridge, prepare a coffee and invite the family or a friend to enjoy the result of this authentic German black forest cake recipe. Guten Appetit.